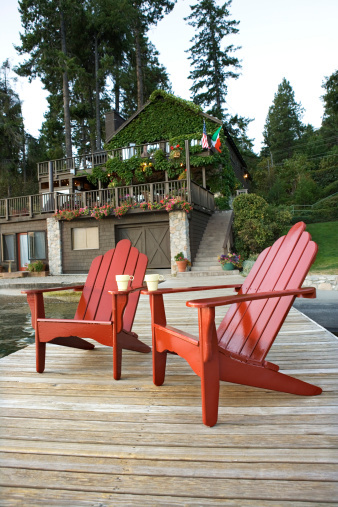 Floating docks can be constructed from any type of material that will float in the water. One material to use for a floating dock is PVC pipe. PVC pipe that is capped on each end will easily float on water and can support about 50 pounds per 10-foot section of four inch pipe. The frame for the your dock needs to be constructed from pressure treated decking. However, you need to first determine how big to build the dock. PVC pipe can be used to support a dock in the water. Determine the width and length for the floating dock with the tape measure, such as five feet wide by 10 feet long. Make a note of the measurements on a piece of paper. Multiply five by 12 to determine the width of the dock in inches. 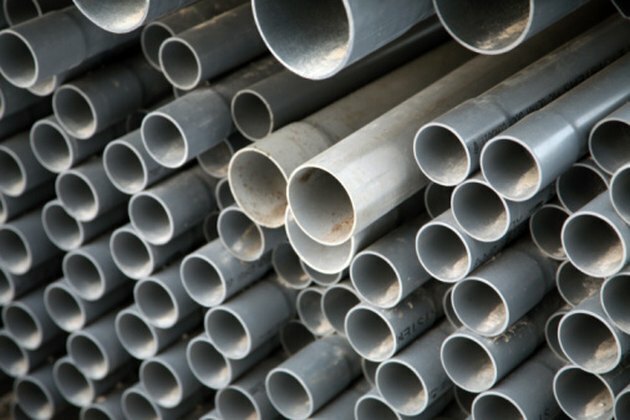 Divide this number by four to calculate the number of 10-foot lengths of PVC pipe will be needed. Double the result to obtain the number of PVC end caps that are required. Apply PVC primer to the outside edge of the first PVC pipe and the inside edge of a flat PVC end cap. Apply the PVC glue to the outside of the PVC pipe and the inside of the PVC cap. Place the cap on the end of the pipe. Allow at least 20 seconds for the PVC glue to set. Repeat this step to glue the end caps on the other PVC pipes. Set two 10-foot lengths of the 2-by-6 inch decking side by side lengthwise. The width of the two outside lengths needs to be five feet. Place one five foot length of 2-by-6 inch decking on top of the 10-foot lengths so end of the wood is flush with the two outside lengths of decking. Drive three screws into the five foot decking and into the 10-foot decking with the power drill. Place the next piece of decking in place and attach with screws. Repeat this step to attach the remaining five foot lengths of 2-by-6 inch decking. Turn the assembled dock over so that it the top side is facing the ground. Place the 10 foot sections of PVC pipe into the dock. Secure the PVC pipe to the wood with nylon straps that are nailed to wood decking. Lift the dock and move it to the water.